Greenwich Market has been on my list of must-visit markets ever since I moved to London about 5 years ago. We finally visited a couple of weekends ago and had a ball! I won't use this space to talk about the quirky handicrafts and artwork or antique and bric-a-brac stalls - which there were plenty of and all very lovely - but will focus on the FOOD. We deliberately skipped breakfast, so we were ravenous when we got to the market and determined to try as many food stalls as we could. What I really liked about the Greenwich Market food was that it was such an eclectic mix. Vegetarian Ethiopian, raw food, handmade noodles, paella and custard tarts all in the same boat. And innovative too. Ramen burgers anyone? The Andes Empanadas: My husband really did not want to try this stall out (he said it was because he finds the colour of empanadas unappetising!) but I was quite stubborn (surely a stall that serves only empanadas must be doing a fantastic job of it?). We shared a chicken and chorizo. I just drooled a little remembering it. Hot, soft and crumbly. 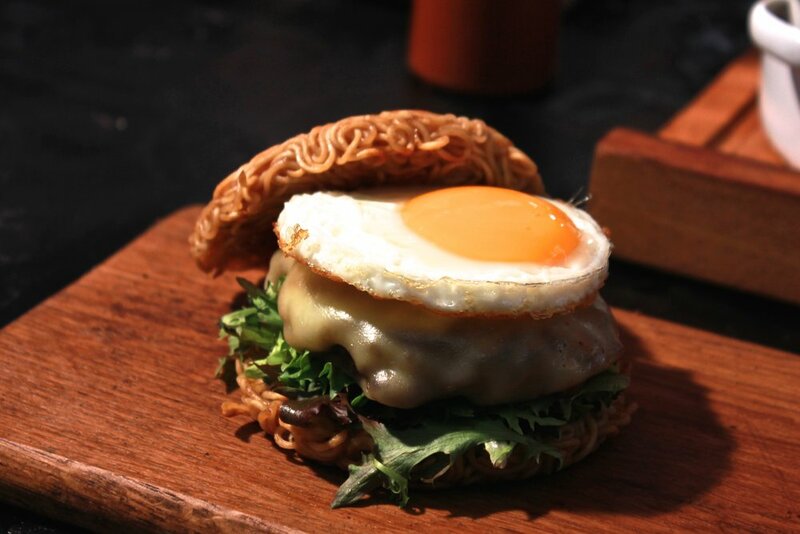 Pimp My Ramen: Clever twist to your normal burger. Replace the bread with ramen that's been cooked and set in a mold. Then grill your ramen, your patty, and put it all together with salad, egg, and sauces of your choice. We had a chicken teriyaki version. Loved every bite. Turnips: The leek and onion cheese toastie was to die for. A gobsmackingly good heart attack on a plate. La-Mian & Dim Sum: They hand make noodles at the stall! Mesmerising to watch. I was dying to give it a go - not sure when I'll have my chance, but it's now on my list of must-do things. We had some freshly steamed prawn dumplings with chilli sauce. Melted away in our mouths. Ethiopian Vegetarian Food: We tried their lentil and onion sambosa. Similar to a samosa but with a 'b' :) Very tasty indeed. Go to Greenwich Market! We made half a day of it on a Sunday, and then spent the rest of the day walking around. There's a nice view from the Royal Observatory, so it's an idea to pick up a few goodies from the market and then head there.